Zambia goes all in with proven tools to fight malaria-spreading mosquitoes, helping more children reach their fifth birthday. In South America, Southeast Asia, and sub-Saharan Africa, some mosquitoes harbor an enormous health risk: malaria. Like a terrible case of the flu, an infected individual’s muscles and joints will ache while chills run through the body; vomiting or diarrhea may follow, especially in children. Without prompt treatment, symptoms can intensify, leading to neurological and respiratory problems, and sometimes even death. With malaria incidence on the rise, Zambia implemented a formal, coordinated National Malaria Control Program to fight the disease. 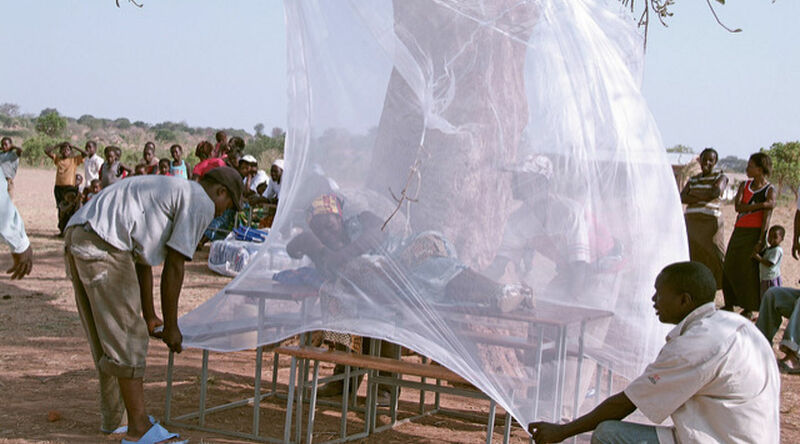 The national strategy laid out four proven interventions to fight malaria: insecticide-treated nets, indoor residual spraying, rapid diagnostic tests, and combination therapy drugs. To ensure effective delivery, the government embraced coordination with churches, mission hospitals, nongovernmental organizations, and copper mining and sugar companies. It also put in place a sophisticated tracking system to monitor progress and adjust strategy as needed. The experience of Zambia, one of the first African countries to scale up malaria control, yields important lessons on the delivery of a multifaceted, comprehensive national malaria program. It stressed both prevention and treatment and included a monitoring and evaluation system that enabled data-driven decision making. The country’s success shows that with leadership, tools, support, and partners, even low-income countries can successfully take on the malaria menace.